Big trees are the prime attraction of California's Sequoia National Park - many groves of the remarkable giant sequoia are found scattered along the moist, west-facing slopes of the Sierra Nevada mountains, between elevations of 5,000 and 7,000 feet. The scale and grandeur of these reddish giants is quite stunning, and the park has many easy foot trails that wind through the woody groves leading to quiet undisturbed places, ideal to contemplate the ambience of the forest. 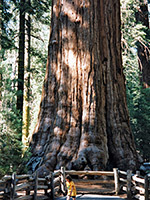 Although the national park contains the largest trees and the most well known groves, many smaller, less accessible groups of sequoias can be found in the adjacent Giant Sequoia National Monument. 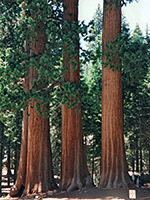 Most visitors come only to see some sequoias, but these trees are found in a relatively small area; the majority of the national park protects a large part of the Sierra Nevada range with canyons, lakes, waterfalls and high mountains, including Mount Whitney, the highest peak in the contiguous United States. Sequoia is half of a combined unit of two National Parks, administered together, the other being Kings Canyon to the north. Sequoia National Park has one spectacular valley, Kern Canyon, that runs north-south near the eastern border, and there are some groves of giant sequoia in Kings Canyon Park, but the name of each park accurately reflects their most important features. Both are relatively quiet and unspoilt compared with some other Southwest parks, and there are few main roads. The approach to Sequoia National Park from the southwest is particularly exciting. A long straight road (CA 198) crosses the dead flat San Joaquin Valley, through endless acres of citrus fruit and vegetables, with the hazy mountain foothills slowly appearing ahead. At first these hills are low and covered only by parched grass, typical of the southern and western extremities of the Sierras; the road slowly gains altitude, passes around the edge of Lake Kaweah and runs through Three Rivers, the last town before the mountains. 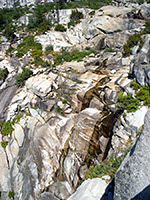 It is named after the Kaweah River, which nearby splits into South, East, North (and Middle & Marble) branches, each of which flows through a steep canyon. 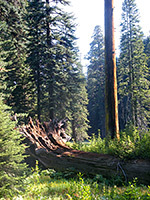 The main road to Sequoia follows the Middle Fork and begins to ascend in earnest a few miles east of town. Part of this section is susceptible to winter flood damage, which sometimes causes reopening to be delayed. For 5 miles the route is along the side of the canyon, gaining in height above the river and crossing the national park boundary. The scenery here is still quite arid, with yucca and other desert plants; this begins to change after the Hospital Rock picnic site where the road turns away from the canyon and heads north into the mountains. The 8 miles between the picnic area and the first group of sequoias at Giant Forest is amazingly steep and twisting, passing through countless hairpin bends and steep grades during a total climb of 3,700 feet. Vehicles over 22 feet are not advised to make the trip; even cars are often reduced to speeds of only 15 mph. On the ascent there are several great viewpoints over the continuation of Middle Fork Canyon far below. 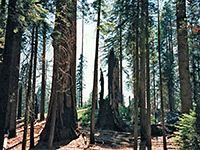 The scenery changes gradually from bushes to small oak trees, to forests of fir, pine and cedar, and finally sequoias; at first these are scattered and relatively small, although still of distinctive color and much larger than the neighboring trees, but quite suddenly the giants are all around, towering above everything else. This is the Giant Forest, centerpiece of Sequoia National Park - an area also including Moro Rock, a granite dome that affords one of the best views of the Sierra Nevada mountains. The road from the main south entrance station through Giant Forest is known as the Generals Highway; this continues across part of the Sequoia National Forest and into the Grant Grove section of Kings Canyon National Park, which has many more sequoia trees. The section between the two parks is closed in winter by snow. Near Grant Grove the highway intersects with the other main road into the mountains (CA 180 from Fresno) - this is rather less steep than CA 198, and is the recommended route to Sequoia National Park for larger vehicles. Driving north along the Generals Highway, the sequoia end a short distance beyond the Congress Grove, at the edge of the Giant Forest, as the road enters regular, thick woodland of lodgepole pine. It soon passes the short side road to the Wolverton ski/picnic area - a center for cross-country skiing in winter, or at other times the main trailhead for long distance hikes into the high Alpine backcountry of the park (see trail index). 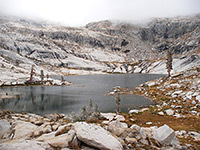 Perhaps the best hike is the 6.5 mile Lakes Trail, which encounters forest, canyons, granite peaks and four beautiful lakes. The Generals Highway next reaches Lodgepole, location of the main park visitor center, plus a market/deli, a nature center, a 204 site campground, and the trailhead for Tokopah Falls. The final 11 miles to the northern Sequoia NP boundary are quite winding, through thick forest for the most part but with occasional viewpoints to the west, and passing Wuksachi Village (a lodge, with bar & restaurant), a picnic area at Halstead Meadow, the Dorst Campground (201 sites), and several more trailheads. Two other roads leave CA 198 giving access to southern areas of the national park. One leads to Mineral King along East Fork Canyon; this is unpaved in places and closed during winter. Mineral King is a former (unprofitable) mining area that is now one of the main starting points for hikes leading into the wilderness areas to the east. The other follows the less steep, more arid South Fork Canyon, where there is a ranger station and more hiking trails. The giant sequoias are abundant but only in small areas, so most of the journey through the park along CA 198 passes just rather featureless fir, pine and cedar trees. In places there are overlooks to the west of distant hills sloping towards the San Joaquin Valley, and also occasional streams, meadows and hiking opportunities. Other highlights of the include Kern Canyon (a very deep glaciated valley in the southeast of the park that is perfectly straight for 30 miles), Crystal Cave (a 3 mile long cavern with many formations, near Giant Forest Village) and 14,495 foot Mount Whitney. This is more easily reached starting from Owens Valley, east of the mountains. A paved road leads to a trailhead at 8,800 feet from where an 11 mile path climbs to the summit. The park has 14 campsites with varying facilities, and the Wuksachi Lodge hotel, 7 miles from Giant Forest Village. Outside the park, the closest accommodations are along CA 180 to the southwest, mostly in the town of Visalia. The largest hotel in the area is Holiday Inn Visalia Hotel & Conference Center (9000 W Airport Drive), with 256 rooms and a rural setting next to the 40 acre Plaza Park which has a golf course, tennis facilities and walking trails. Nearby towns with hotels (distances from the south entrance) are Three Rivers (6 miles), Exeter (27 miles), Lindsay (27 miles), Visalia (35 miles), Tulare (37 miles), Porterville (44 miles) and Dinuba (46 miles) - follow the links for hotel descriptions and photographs.